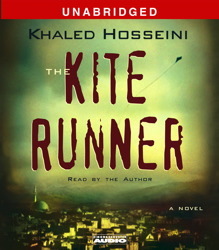 Listen to "The Kite Runner" on your iOS and Android device. As a father of three boys, reading this book impacted my thoughts and emotions like no other book has before. Amazingly heart wrenching and thought provoking. You must read this book. This one is a real good read/listen. It keeps you engrossed in the story, and you don't know what's coming until you actually read/listen to it. It will definitely make you sad at points and you will get attached to the characters. I highly recommend it. Although this book is one of my favorites thus far, at one point, I almost stopped listening to it- because it made me so mad. I think once I got past the most heartbreaking (and emotion provoking points in the story), it just made you love the story even more. I definitely recommend. I lost myself completely in this story. It's beautiful, gut-wrenching, and wonderfully written. The author's narration is terrific, it was nice to hear it read by someone with the correct accent for the mind of the main character.. Loved the book, I did not want it to end. It will tear your heart out and replace it with an unbelievable experience. After I read it, I wanted to look up more books like it. the story is captivating, the accent and persian word used by the author and narrator Khaled Hosseini give this audiobook a very personal touch. an insight into Afghanistan, the social and ethnic mosaic and the history. This narration by the author Khaled Hosseini is so authentic and is read with such clarity. This is a great novel and it is enhanced by this narration. The pronunciation of the names in Farsi leads the listener in and brings the story to life. One of the greatest and most heart touching books I have ever read. I enjoyed every second of it. I am about to read more of this author. Fascinating book that gripped my attention and wouldn't let go. The author really makes you feel like you are getting to know the characters on a deep level, and you end up really caring about them. The book was read by the author, which made it even more powerful. A few other reviewers are mentioning that his accent was difficult to understand, but I have no idea where that remark came from, because it was perfectly clear to me, and the pronunciation of a few non-English words scattered throughout the tale sounded beautiful. Overall this was a profound, thought-provoking book that was sometimes painful but always worthwhile. Highly recommended!